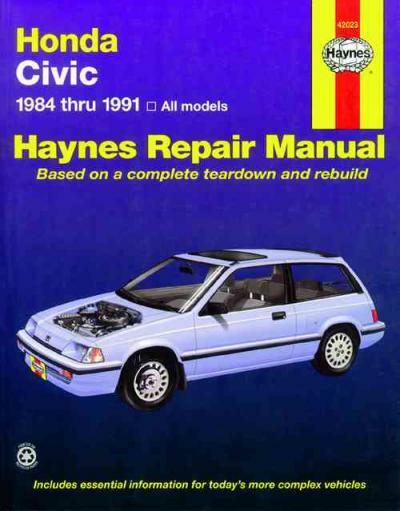 Honda Civic 1984 - 1991 Haynes Owners Service Repair Manual covers: Hatchback, Sedan, Wagon CRX 1984 - 1991.Inside this manual you will find: Routine Maintenance, tune-up procedures, engine repair, cooling and heating, air-conditioning, fuel and exhaust, emissions control, ignition, brakes, suspension and steering, electrical systems and wiring diagrams.Haynes repair manuals can save you money on maintenance and repair bills. Step-by-step procedures and illustrations guide you through every job, from basic maintenance and troubleshooting, to complete teardown rebuild. The Honda Civic is a line of subcompact plus subsequently compact vehicles produced by Honda. The Civic, together with the Accord plus Prelude, composed Honda's cars available inside North America till the 1990s, whenever the model lineup was extended. Having gone by many generational changes, the Civic has become greater plus more upmarket, plus it currently slots between your Fit plus Accord. It was introduced inside July 1972 because a two-door model, followed with a three-door hatchback which September. With the transverse engine mounting of its 1169 cc engine plus front-wheel drive like the British Mini, the vehicle offered superior inside area despite total tiny dimensions. Early models of the Civic usually included a standard AM radio, heater, foam-cushioned plastic trim, two-speed wipers, plus painted steel rims with a chromed wheel nut limit. As the years went by, it has become more upscale with choices like air conditioner, force locks, energy windows, leather upholstery, satellite-linked navigation, along with a six-speed guide transmission. Initially gaining a standing to be fuel-efficient, reliable, plus eco-friendly, later iterations have become recognized for performance plus sportiness, specifically the Civic Type-R, Civic VTi, Civic GTi plus Civic SiR. The Civic has been rebadged for global markets with these models because the Honda Ballade that became the British Leyland-produced Triumph Acclaim inside Britain plus Honda Domani/Acura EL. The Civic platform furthermore served because the basis for the Honda CR-X, the Honda CR-X del Sol, the Honda Concerto, the initially generation Honda Prelude, the Honda Civic Shuttle, as well as the Honda CR-V. Starting inside 1985 till 2006, the Civic was focused on Japanese dealership Honda Primo, with Civic variants available at Honda Clio, plus Honda Verno places. As of 2006, a total of 16.5 million Civics had been available internationally, with 7.3 million of them inside the United States. By 2012, Civic has been the top-selling vehicle inside Canada for 14 years. With significant fuel costs along with a weak economy inside June 2008, the Civic supplanted the Ford F-Series with become the top-selling car inside the United States for which month. The Civic is located among the top-selling vehicles of California, verifiable because of the initially half of 2013, where it accomplished the best destination. In Japan, manufacturing of non-hybrid Civic for domestic marketplace ended inside August 2010 plus manufacturing of Civic crossbreed for house marketplace ended inside December 2010 whenever it no longer complied with Japanese Government dimension laws inside the width category. In latest years, buyers changed with minivans plus compact vehicles like Honda Fit. Honda established Fit crossbreed inside October inside Japan. But, manufacturing of Civic plus Civic crossbreed for export markets can continue. The today normal constant-mesh gearboxes, that may include non-synchronised, or synchronized/synchromesh systems, where usually diagonal cut helical gear sets are regularly "meshed" together, along with a dog clutch is chosen for changing gears. On synchromesh boxes, friction cones or "synchro-rings" are utilized inside addition with the dog clutch with carefully match the rotational speeds of the 2 sides of the transmission before creating a full mechanical engagement. The past kind was standard inside numerous classic vehicles before the development of constant-mesh manuals plus hydraulic-epicyclic automatics, elder heavy-duty pickups, plus will nevertheless be found used inside certain agricultural equipment. The latter is the contemporary standard for on- plus off-road transport guide plus semi-automatic transmission, though it can be found inside numerous forms; e.g., non-synchronised straight-cut inside racetrack or super-heavy-duty applications, non-synchro helical inside most thick pickups plus motorcycles plus inside certain classic vehicles, plus partly or totally synchronised helical inside all contemporary manual-shift passenger vehicles plus light pickups. Manual transmissions are the most commonly known kind outside North America plus Australia. These are typically cheaper, lighter, generally provide greater performance, however the latest automatic transmissions, plus CVTs provide greater gas economy. It is customary for brand-new motorists with discover, plus be tested, about a auto with a guide gear change. In Malaysia plus Denmark all vehicles selected for testing have a manual transmission. In Japan, the Philippines, Germany, Poland, Italy, Israel, the Netherlands, Belgium, New Zealand, Austria, Bulgaria, the UK, Ireland, Sweden, Norway, Estonia, France, Spain, Switzerland, the Australian states of Victoria, Western Australia plus Queensland, Finland, Latvia, Lithuania as well as the Czech Republic, a test pass utilizing an automatic automobile refuses to entitle the driver with employ a manual automobile found on the public road; a test with a manual vehicle is needed. Manual transmissions are more usual than automatic transmissions inside Asia, Africa, South America plus Europe. Manual transmissions could include both synchronized plus unsynchronized gearing. As an example, reverse gear is generally unsynchronised, because the driver is just expected with engage it whenever the car is at a standstill. Many older cars additionally lacked synchronisation about initial gear, meaning it moreover may just be chosen for moving away from a stop except the driver became adept at double-declutching plus had a specific have to frequently downshift into the lowest gear. Many manual transmissions have a very low ratio for initially gear, called a creeper gear or granny gear. Such gears are not synchronized. This feature is usual about pick-up pickups designed with trailer-towing, farming, or construction-site function. During usual on-road employ, the truck is commonly driven without utilizing the creeper gear at all, plus 2nd gear is utilized from a standing begin. Many off-road cars, many very the Willy's Jeep as well as its descendants, moreover had transmissions with "granny first"s either because standard or a choice, however this function is today more usually offered for with a low-range transfer gearbox connected with a general totally synchronized transmission. After a period of developing idiosyncratic vehicles like the Honda 1300 which met a lukewarm reaction inside Japan, Honda considered pulling from vehicle production completely by the early 1970s. But, Honda introduced a more traditional car inside 1972 called the Civic that instantly reversed their flagging fortunes due with its economy, security plus cheap inside an era of increasing gas costs. Honda's CVCC development, aided Honda meet emission practices of the 1970s plus early 1980s without a costly catalytic converter assisting with keep fees down. The 3rd generation Honda Civic is an vehicle that was yielded by Honda from 1983 with 1987. It was introduced inside September 1983 for model year 1984. The Civic's wheelbase was improved by 2â5 inches with 93.7 inches or 96.5 inches. A three-door hatchback/kammback, four-door sedan, the five-door "Shuttle" station wagon, plus sporting CRX coupÃ© shared usual underpinnings. This included independent front control arms with torsion bar springs along with a semi-independent back beam with coil springs. But, the body panels were mostly different between models. The Civic-based Honda Quint five-door hatchback equally underwent a model change, plus became the Honda Quint Integra, accessible because both a three- plus five-door fastback. The Quint Integra was available at the Japanese Honda Verno dealership together with the CR-X. The Civic inside Japan was today exclusive with Honda Primo, together with Honda's kei vehicles and superminis like the Honda City. At its introduction inside 1983, it claimed the Car of the Year Japan Award. The sedan plus hatchback shared the same dashboard, however the CRX plus wagons both had their own distinctive dash. The hatchback adopted a flatter rooftop over the back seats, attracting affects from a bodystyle acknowledged inside Europe because a shooting-brake, which appeared with blur the description between traditionally defined hatchbacks as well as the shooting-brake. The flat rooftop, 3 door hatchback appearance was equally utilized found on the supermini Honda City, as well as the Honda Today, the auto which returned Honda with kei auto manufacturing. This appearance was furthermore chosen found on the Honda Accord Aerodeck. The Honda CR-X was truly the only three-door hatchback which adopted a fastback, sloping back hatch, showing the performance auto appearance diagnosed with Honda Verno items throughout the mid-1980s. In Europe, the sedan model was moreover advertised because the Rover 213/216, when inside Japan it was advertised inside parallel because the Honda Ballade. Both the Sedan plus Hatchback models were equally available inside Indonesia below the name Civic "Wonder". A fresh 12-valve 76 hp, 1,500 cc inline-four engine was introduced. The base hatchback plus CRX 1.3 selected the 1,300 cc 8-valve engine offering 60 hp. The DX plus 1500S model hatchbacks shared the brand-new 1,500 cc engine with all the sedan, wagon, plus CRX 1.5. The 1500S model accomplished over 50 mpg-US highway. European vehicles received a 1,200 cc engine at the bottom of the ladder, with 62 PS. This was just obtainable in the hatchback, whilst the sedan range started with a 1300 with 71 PS. The Shuttle was just accessible with all the 85 PS "1500", that moreover appeared inside the 'S' hatchback, whilst the CR-X received a gas injected variation of the engine producing 100 PS. All of these motors have 3 vales per cylinder. The three-box sedan wasn't intended for sale inside the European widespread marketplace, initially just being obtainable in EFTA markets including Sweden plus Switzerland. In 1986, the Civic got flush-mounted headlights, revised tail-lights, unique wheel cover designs plus additional minor aesthetic updates. The optional three-speed automatic transmission furthermore gained O/D creating it a four-speed automatic. Honda initially adopted the Si badge for the Japanese domestic marketplace third-generation Civic inside November 1984. Mainly available inside hatchback shape, the key artistic difference for the Si had been a slight bulge inside the bonnet, that accommodated the taller DOHC engine. A four-door sedan variant equally existed inside Japan, however was just yielded inside little numbers plus is uncommon. Designated because ZC1 inside Japan plus D16A1 inside Europe, the hot engine place out 122 hp, allowing the auto with hit 122 mph plus go from 0â60 mph inside 8.9 seconds. Because compact vehicles at the time usually prepared lower than 100 hp, the Si proven prevalent among fanatics. In Europe plus inside the United States, a somewhat sporting Civic "S" trim was introduced with the hatchback inside 1984. The European variation receives a carburetted variation of the 12 valve 1.5, producing 85 PS. In the US the Civic S featuring sports seats plus reclining back seats. Although the S retained the semi-independent back beam with coil springs for the suspension, a back stabilizer bar was put into better handling. Unlike the JDM Civic Si, the S trim employed the same carbureted 1.5 L EW1 engine because the base as well as the DX trims. 1985 finally saw the US launch of the Si trim with all the Civic CRX Si, that showcased a fuel-injected, 1.5 L SOHC EW3 engine creating 91 hp. In 1986, the Si trim was extended with the Civic hatchback, providing the same performance of the CRX Si however, with four-seats. Added improvements for the Civic Si hatchback included a removable glass sunroof, a five-speed guide gearbox, tilt steering wheel, a full-width taillight panel, a color-keyed front airdam, sedan-style drive wheel covers, along with a rooftop spoiler. Like the CRX Si, the Si hatchback was driven with a 91 hp, 12-valve SOHC engine designated EW4/D15A3. The Civic Si additionally saw a launch inside New Zealand plus Australia inside 1987, sharing requirements synonymous to people of the American-market Si. In Europe the gas injected 100 PS absolutely selected inside the CRX was installed inside the Civic hatchback too, beginning inside 1985. It was called the 1.5i GT instead of Si, because the Si name was held inside reserve for the later, more effective 1.6 litre adaptation. The Honda CR-X, initially established because the Honda Ballade Sports CR-X inside Japan, is a front-wheel-drive sports compact automobile which was produced by Honda between 1983 plus 1991. It was changed by the Honda CR-X del Sol for the 1992 model year. Although there are numerous supposed definitions for the acronym CR-X, the many generally accepted is "Civic Renaissance Model X". In the US-spec, the CR-X was advertised because an economy sport kammback, with area for 2 travelers. The European-spec automobile received a ZC 130 hp engine along with a 2+2 seating arrangement. Redesigned inside 1988 plus yielded with 1991, the CR-X was prevalent for the performance, nimble handling, plus wise gas economy. In the United States, its performance model, the Si not the equally sized JDM Si 1590cc DOHC engine), had been a favorite. Honda's 1992 CRX del Sol was advertised because a CR-X inside certain markets. The initial generation CRX was available inside several parts outside Japan because the Honda Civic CRX. At its introduction, the CRX was obtainable in Japan at Honda Verno dealership sales channels, plus accompanied the Vigor, the Quint, as well as the Prelude. The authentic 1.3 liter automobile had an EPA Highway mileage rating of 52miles per gallonin 1984 plus was reported with frequently achieve over 70 MPG inside positive driving conditions. The later 1.5 liter American-market CRX HF model might additionally reliably achieve great fuel mileage, over a decade before gas-electric hybrids appeared available, at no cost premium over the base model; the 1.5 liter is rated by the U.S. Environmental Protection Agency at 42 miles per U.S. gallon city plus 51 miles per U.S. gallon highway. The Japanese Si plus European 1.6i-16 models came with a 1590 cc DOHC engine placing out 135 bhp inside the UK-spec model plus 140 bhp inside the JDM model. Though synonymous versions of the same engine, the Japanese Si engine was stamped ZC, while the European engine was stamped ZC1. The five-door wagon received specific bodywork plus interior. "Shuttle" inside many nations, it was called the wagon plus "Wagovan" inside the United States; the variations being the wagon having 50/50 split folding cloth fixed back seats which reclined with 4 different positions, as well as the Wagovan having a plastic single part back seat which slid forward to support extra cargo and also metal bars over the back side windows. It was also available because a "full" van, called "Pro", for commercial consumers inside the Japanese domestic marketplace. The Shuttle's appearance because a "tall wagon" was synonymous to this of the idea automobile Lancia Megagamma introduced earlier. The wagon was initially just obtainable in front-wheel drive; inside 1985 a part-time any-speed four-wheel drive, operated with a drive switch found on the dash, became accessible. The four-wheel drive transmission furthermore introduced a low-speed "granny gear" that may just be involved inside four-wheel drive. Externally, not much was changed apart from "4WD" stickers: the back bumper was somewhat heavier plus mudflaps were standard, when the ground clearance was improved with 177 mm, up from 165 mm. The central tunnel for the driveshaft was unusually low plus just minimally affected inside room. In Europe the 85 PS 1.5 liter 12 valve 'four' within the standard Shuttle was fitted. In 1987, the four-wheel drive program found on the wagon was changed; a brand-new Real-Time four-wheel drive program showcased an automatic viscous coupling which changed force with the back wheels automatically whenever required. Real Time 4WD models are recognizable by the charcoal gray center covers, covering the lug crazy that were exposed about FWD models.